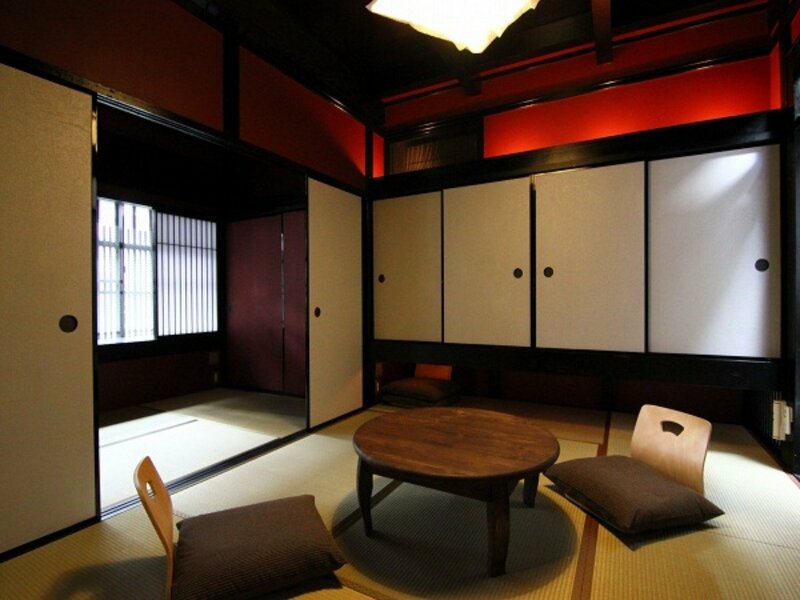 This machiya expresses the light of new hope and the evanescence found during Japan's 'Romantic Taisho Era' (1912 to 1926). 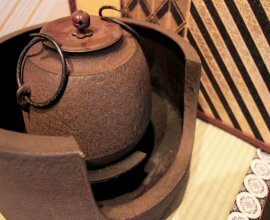 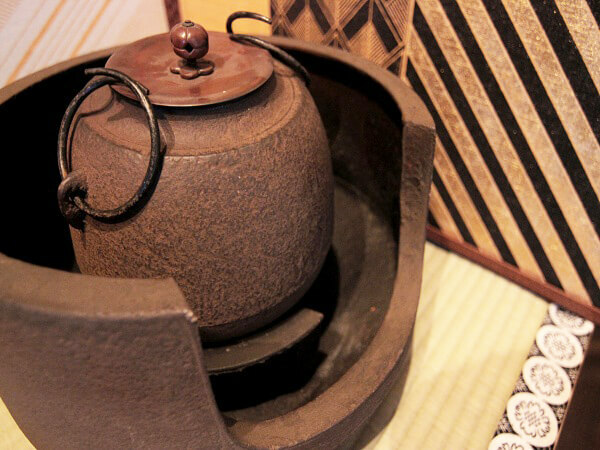 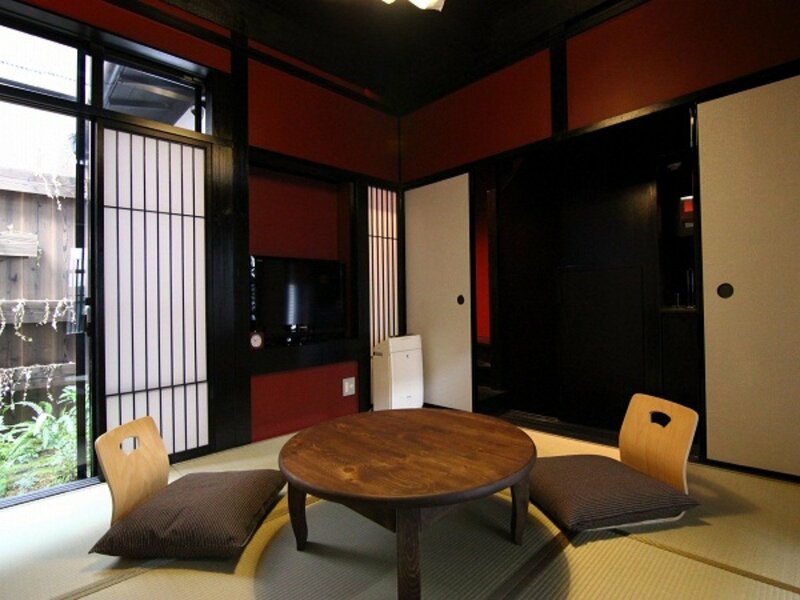 A time when Japan had recently been exposed to a slightly more western lifestyle, this era ushered in the perfect balance between the traditional Japanese style combined with the vibrant and international scene of the Meiji Period. 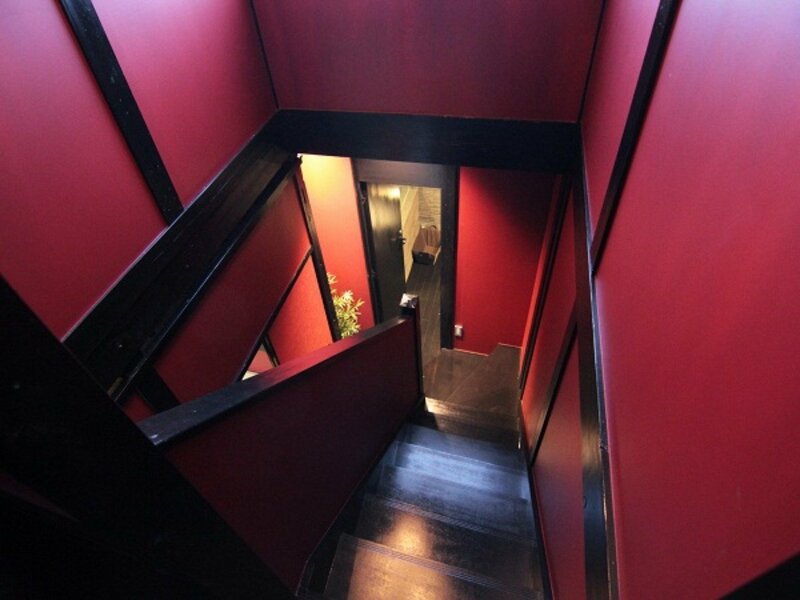 "Suo-an" machiya house, accentuated with shades of crimson, is a townhouse that reflects the influence that modern design had on the traditional machiya house. 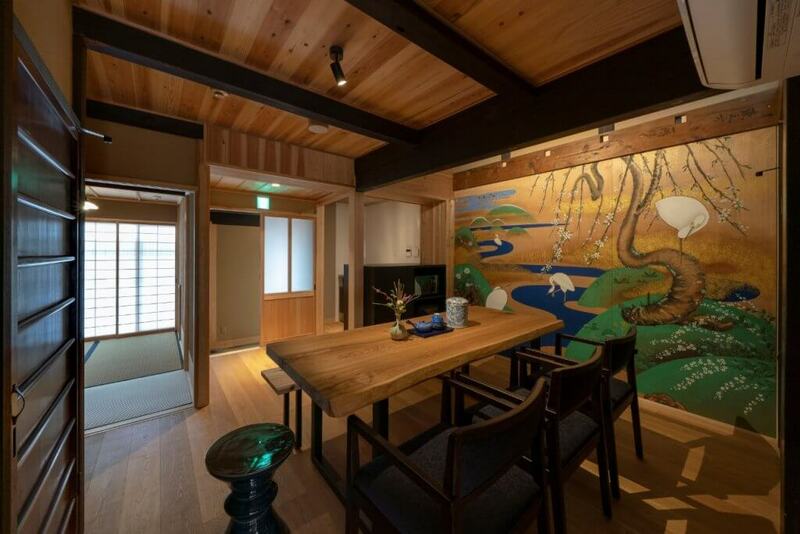 A large wooden beam stretches across the ceiling -- portraying the charm of the traditional architecture. 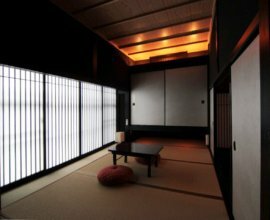 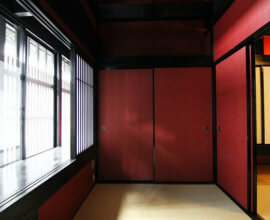 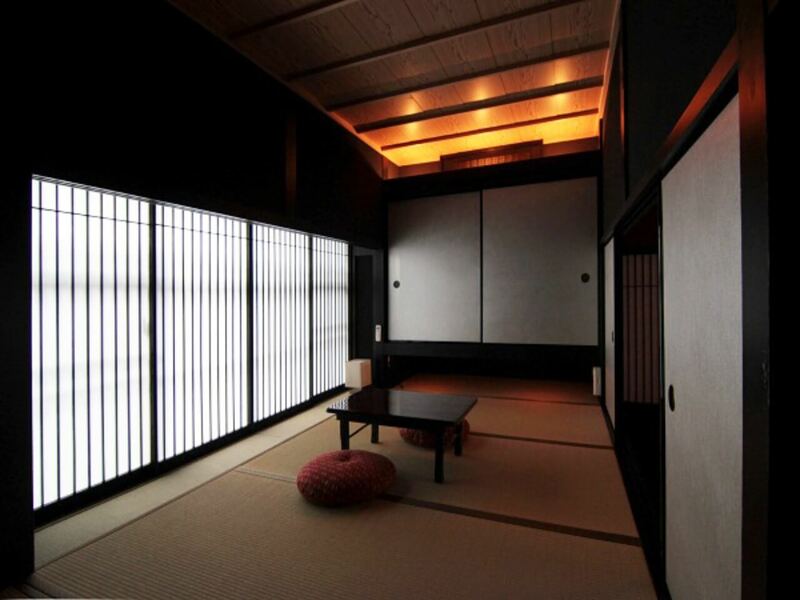 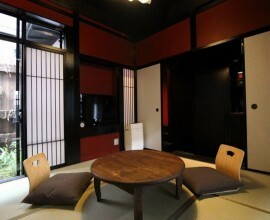 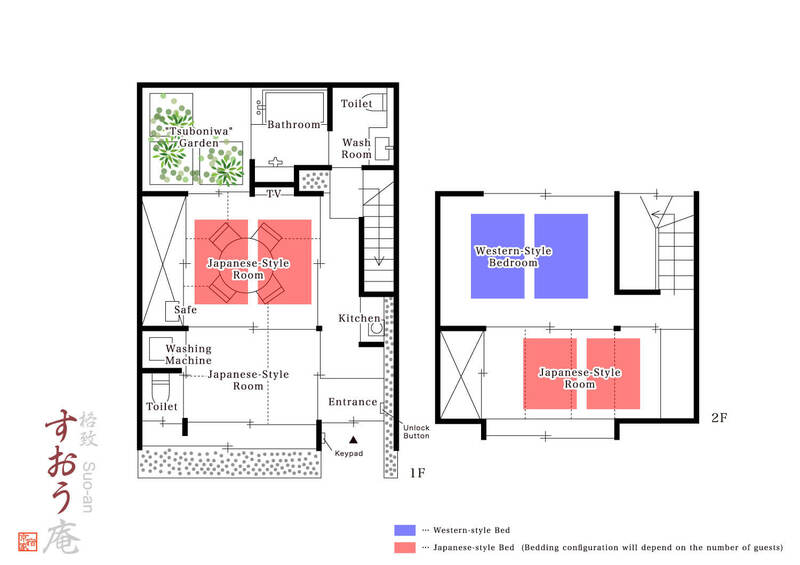 Tatami-mat lined rooms that have been designed with the Japanese tea ceremony room in mind. 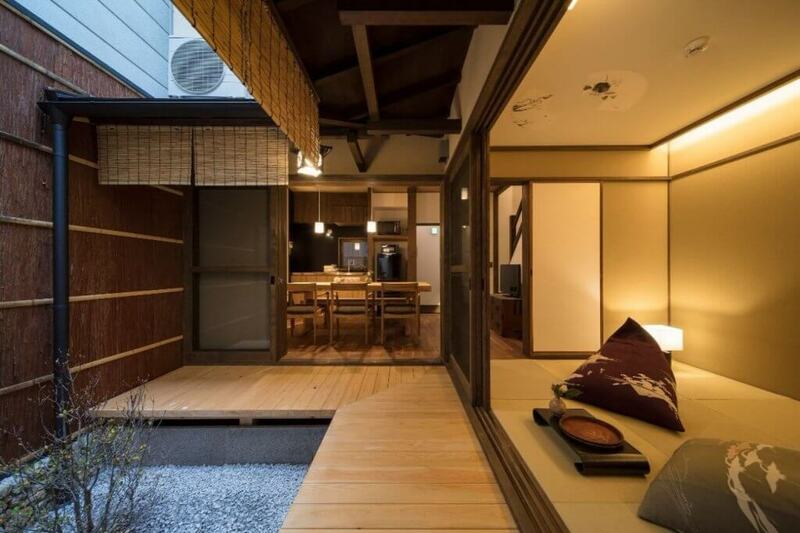 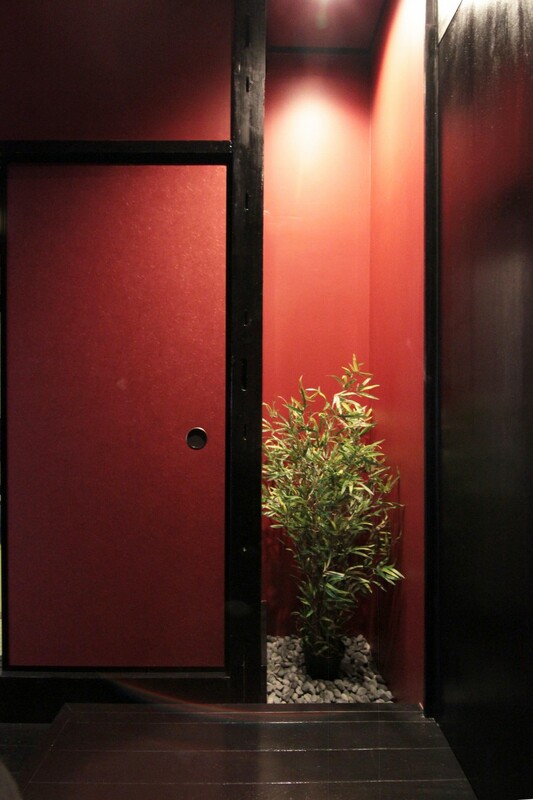 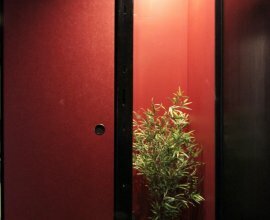 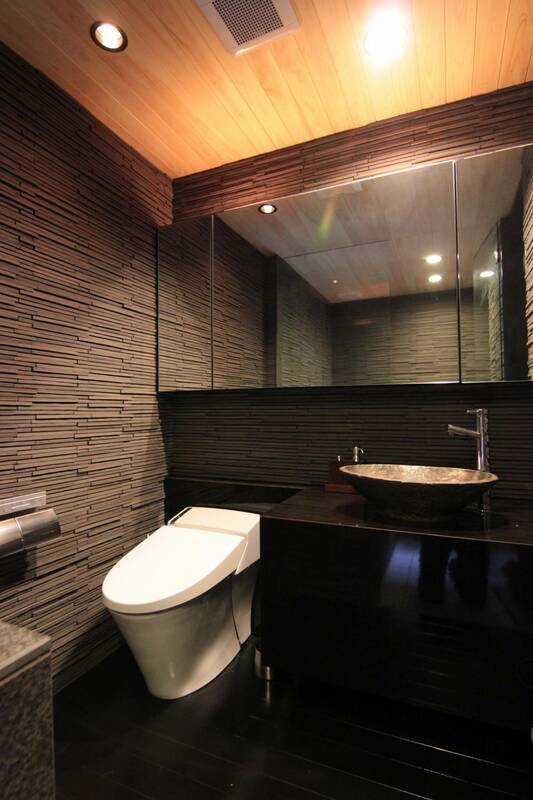 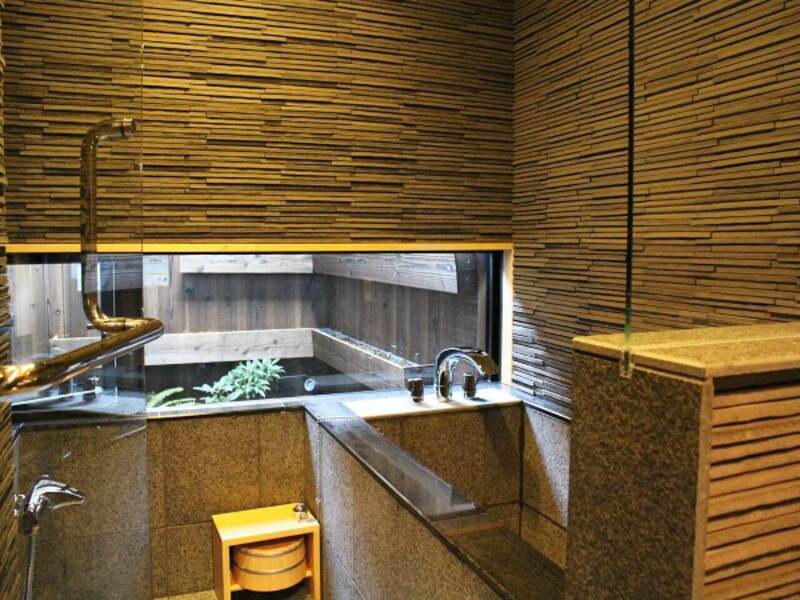 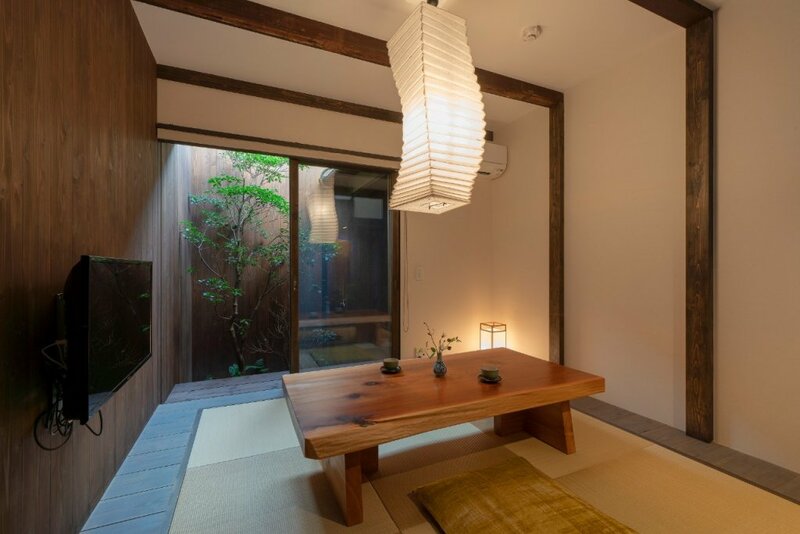 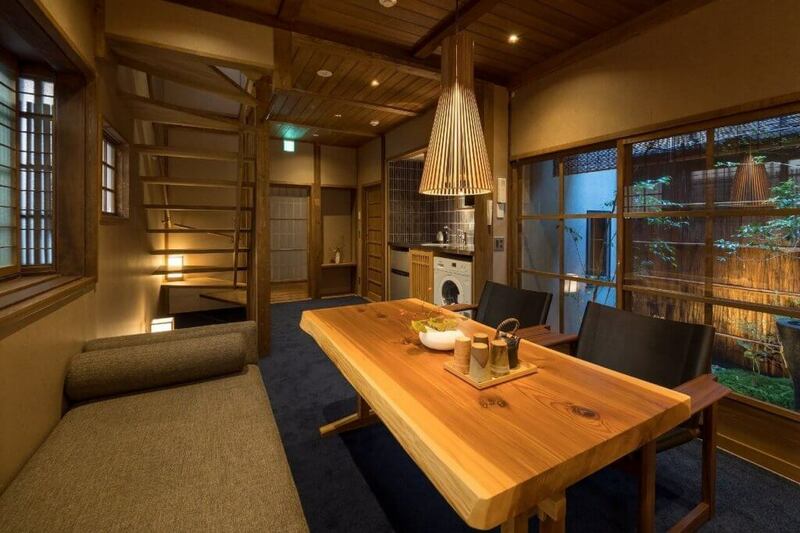 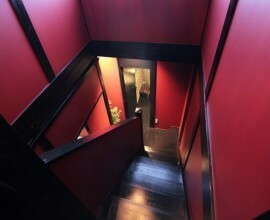 Enjoy an atmosphere that can only be experienced at Suo-an machiya house. 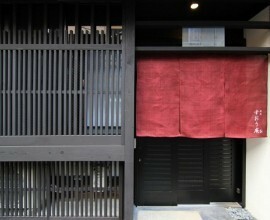 Wooden Lattice While passerbys cannot look in, lattice allows those inside to enjoy the outside view. 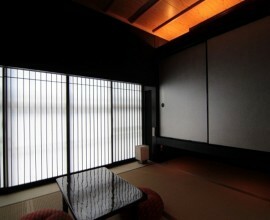 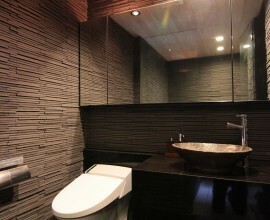 It also allows sunlight to pour into the house, creating a warm and cozy atmosphere. 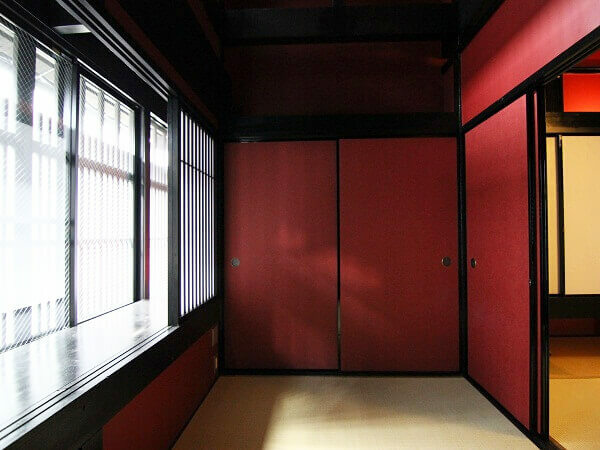 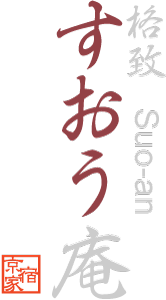 Red Colour This deep colour is found in many elements throughout "Suo-an". 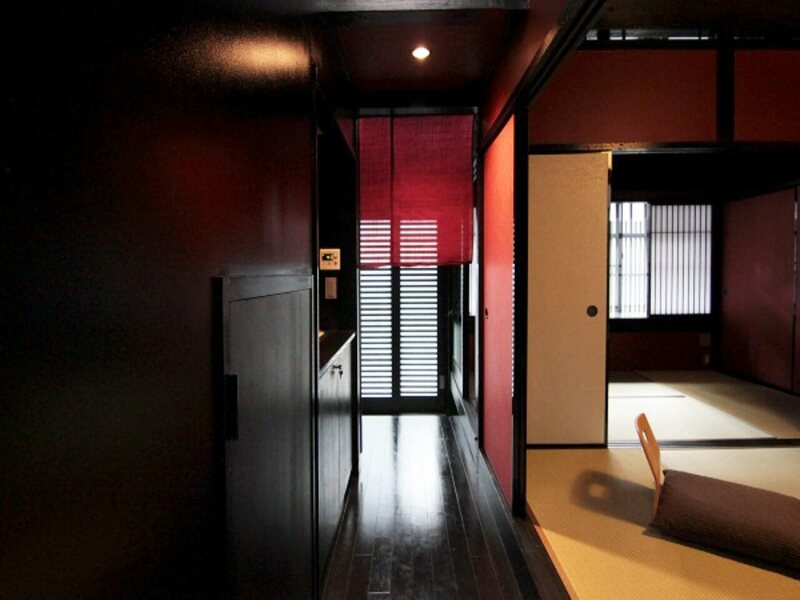 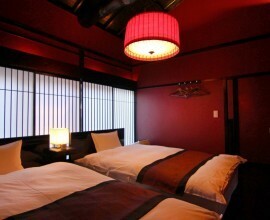 Notice how the crimson of the walls, lanterns and noren curtains change along with the natural light. 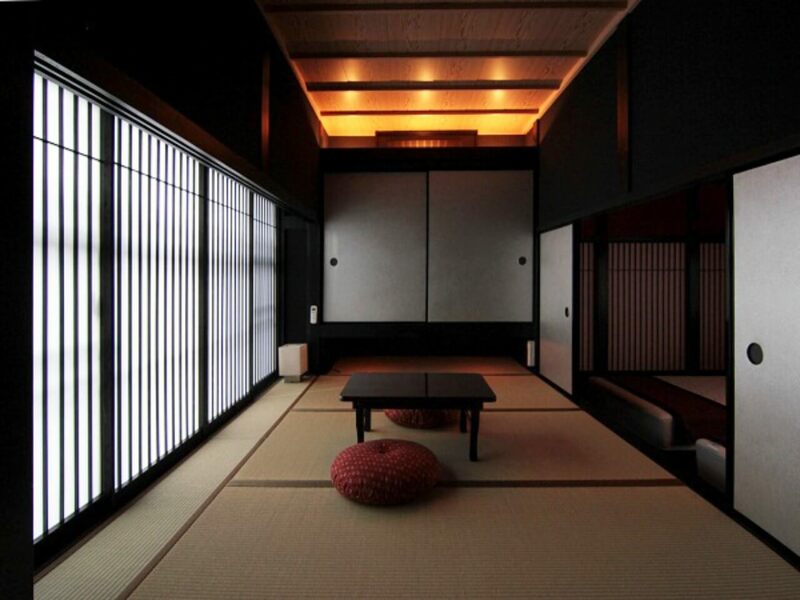 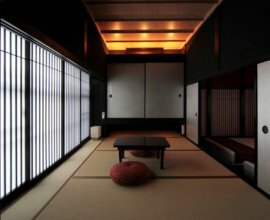 Soft illumination Warm lighting plays up the deep red and sleek black create a luxurious ambiance in this Japanese room. 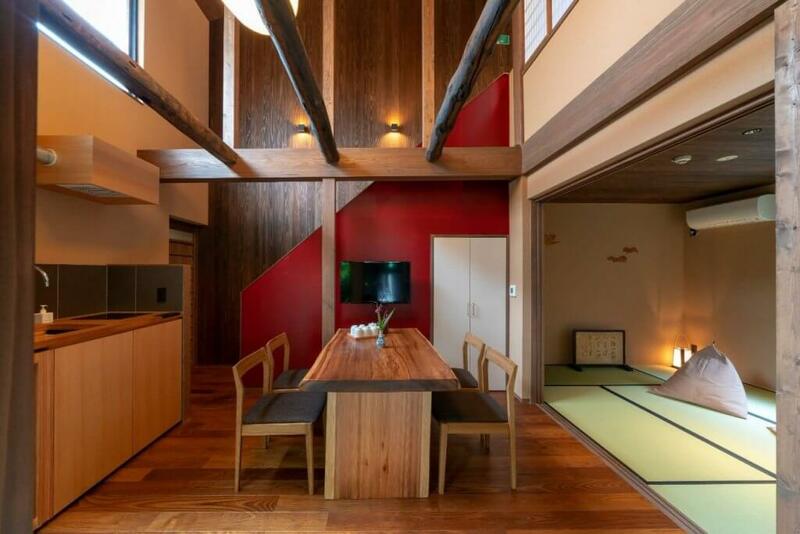 Bask in the natural light filtering through the lattice windows. 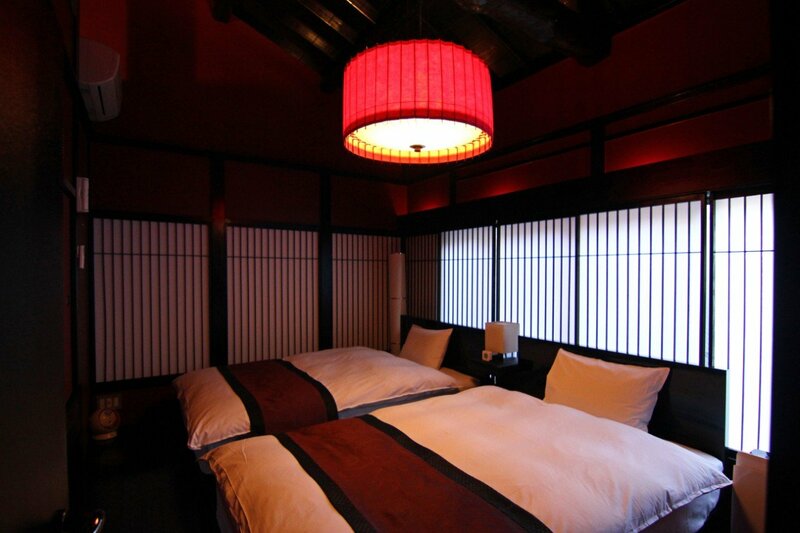 Western-style Bedroom Traditional wooden beams along the bedroom’s high ceilings create an open space. 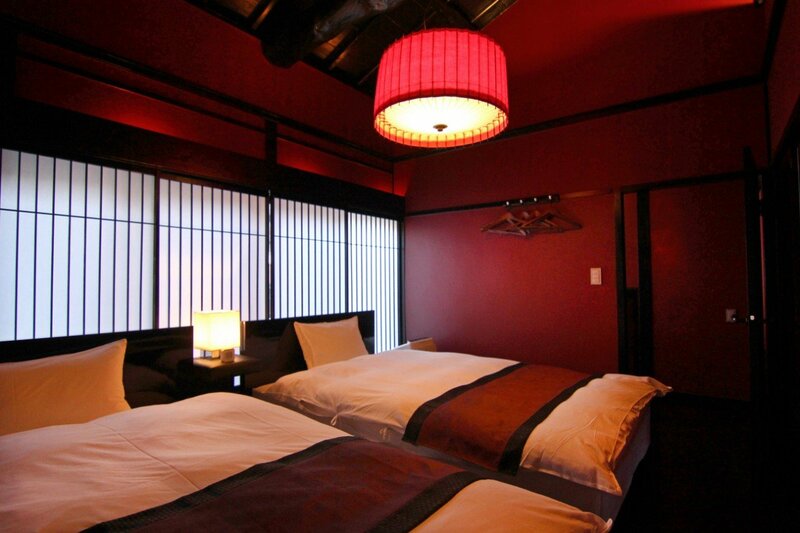 The red light fixture above the bed showcases a modern take on the traditional Japanese paper lantern. 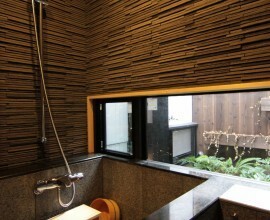 Bathroom Relax in serenity in this bathroom lined with lemon-scented cypress wood, a granite-tiled bathtub and a garden view. 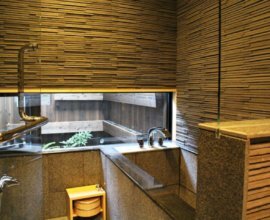 Custom-created bath amenities will leave you refreshed and ready for the day. 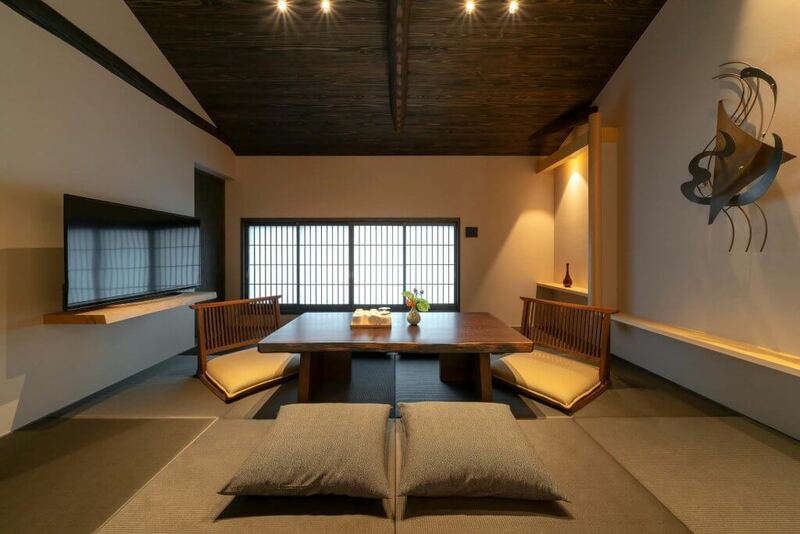 Japanese-Style Rooms Appreciate the architecture of the open ceilings, exposed wooden beams and tatami mats. 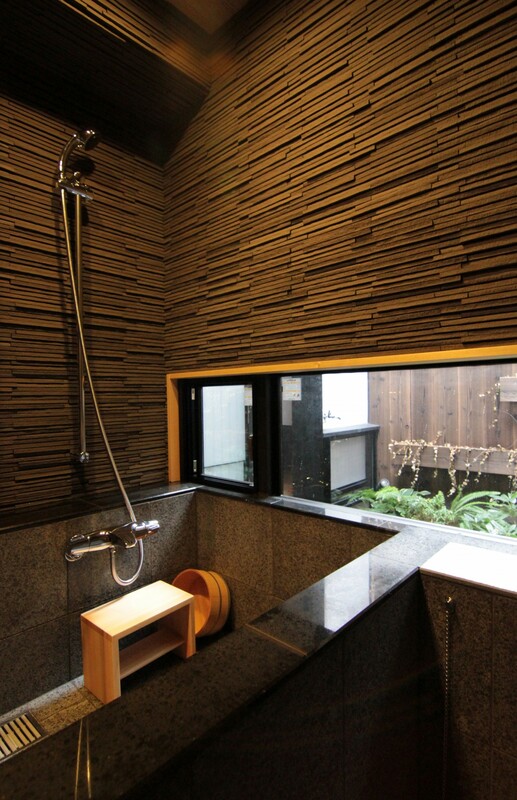 The lattice windows allow natural light to bathe the room in a soft glow. 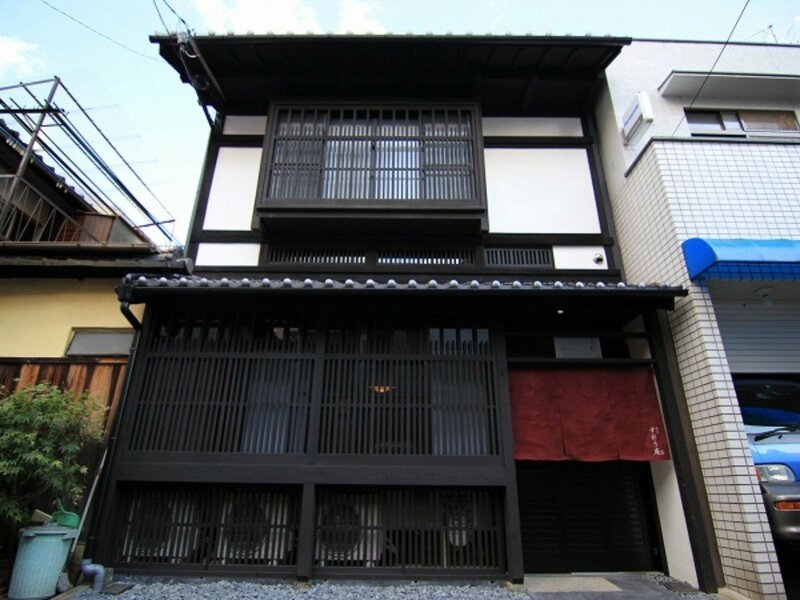 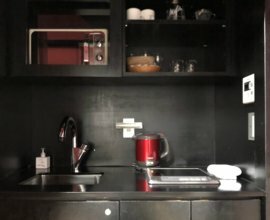 9-minute walk from "Shijo" - Kyoto's popular shopping and dining district - and Shijo subway station, just 2 stops from Kyoto Station. 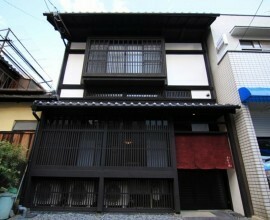 The "Shijo" area of Kyoto is known to be the popular shopping and dining district. 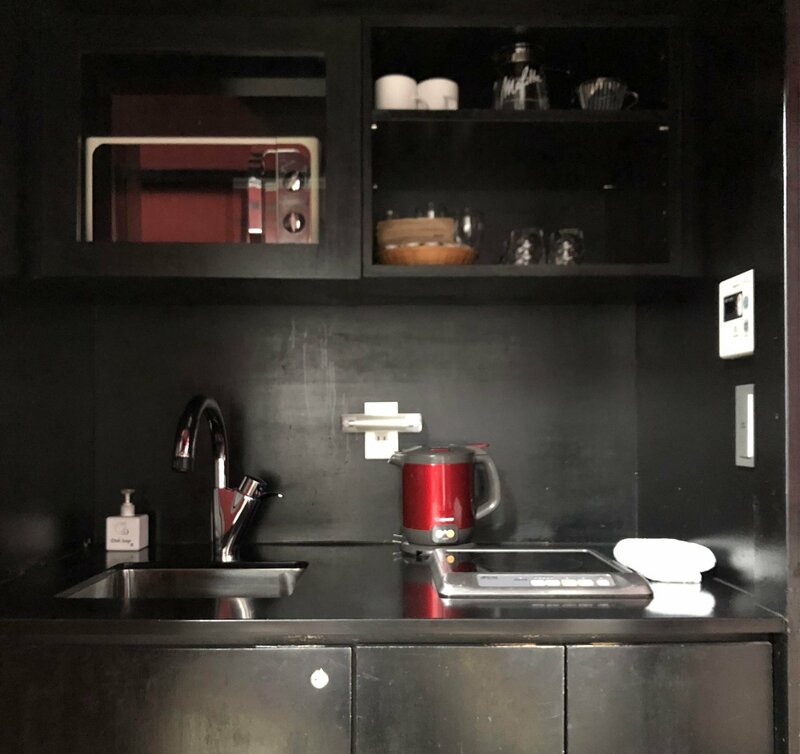 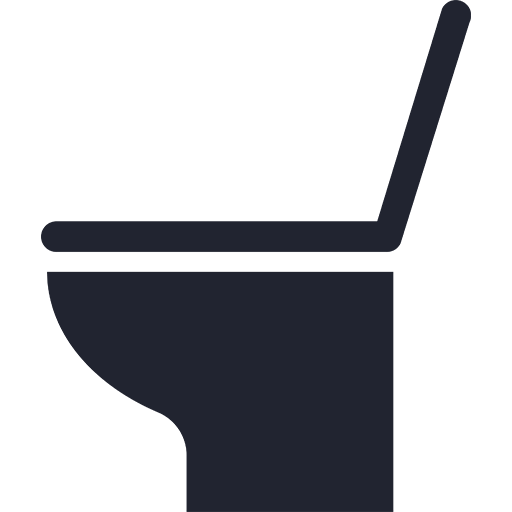 You will find plenty of dining options to choose from -- all within walking distance. 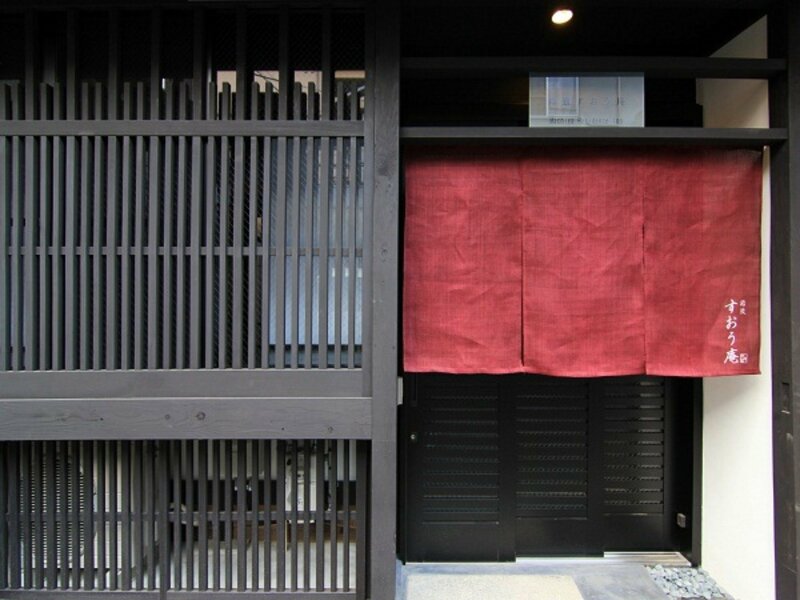 We recommend "Nishiki Market," a lively shopping arcade with shops that sell fresh seafood & poultry, Kyoto-grown produce, hand-made side dishes, and more. 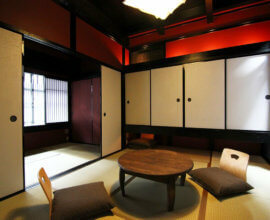 Explore the entire Higashiyama area (located east of Suo-an). 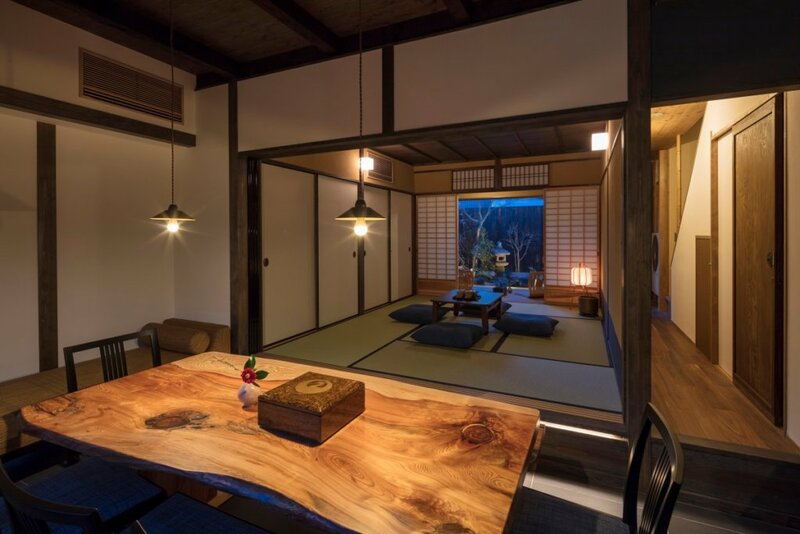 You'll be able to see the wonders of Kiyomizu Temple, the cherry-blossom lined Philosopher's Path during the spring, the cool gardens of Kenninji Temple, and more. 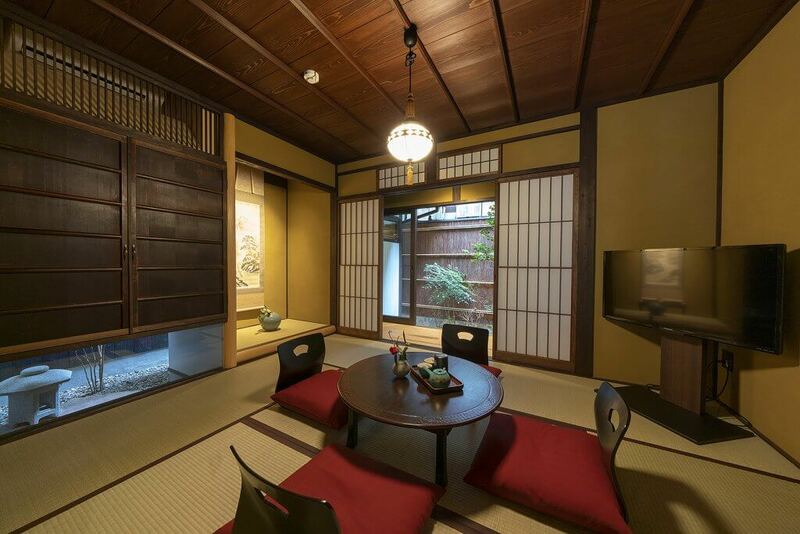 Take the Kyoto City Subway West to Nijo Castle -- a castle with an interesting history and background regarding its former resident and architecture.